As you may know by now, I’m a big fan of restaurants that make an effort to have an approachable, yet sophisticated wine program. Privateer in Oceanside has been serving up great food since 2012, but two years ago opened a wine bar and public market that offers an international wine program and events, along with products from local purveyors of desserts and merchandise. Susan Porter-Guarino heads up that program and she was the one I connected with about revisiting Privateer. Before I get into more on the restaurant and market, I honestly did not know what a privateer was … though my hunch was that it had something to do with a pirate. They were essentially pirates with government protection that allowed them to pursue less than legal goals regarding wealth, dominance and control of the seas. It was only legal in relation to the countries they had papers for. So basically they were a less shady pirate. I’m not the first one to make the correlation between culinary industry workers and pirates and it’s one of the reasons I love telling their stories … because for the most part they have killer stories! Privateer co-owner Charlie Anderson has the look for sure and his colorful road to opening Privateer illustrates my point. He grew up surfing and working at restaurants in Oceanside and segued that into the action sports industry helping to launch Dragon Optical then spent 17 years with TransWorld Media. He and his wife started a small coffee cart business at Buccaneer Beach and a second location at the Captain’s Helm, which led to The Buccaneer Café, their first foray into the restaurant business. So the pirate thing was even more pronounced for Charlie. Fast forward to 2012 when, along with good friend Jamey Stone, he opened Privateer in its current South Oceanside location. 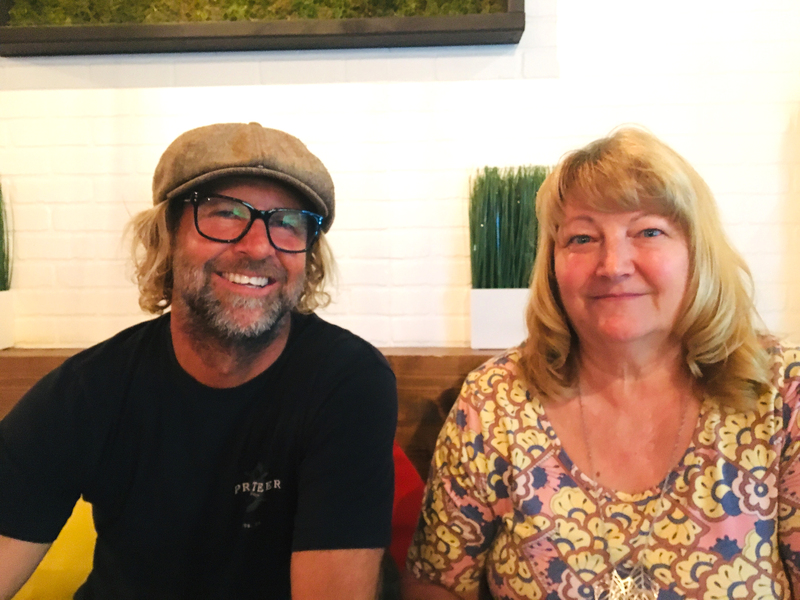 Our no-filter, heavy on the laughs conversation over food and wine with Susan Porter-Guarino just confirmed that yeah, this guy has lived a life full enough to warrant the name Privateer on his restaurant. OK, so back to the restaurant. The interior made me think I was in a Dean & DeLuca in New York or something similar in San Francisco. It’s a great look and very unique in these parts. There is a restaurant side and a market side that has plenty of seating. I really had no idea what the coal fire differentiator was, so that was my first question. Basically it burns cleaner and hotter than wood and imparts no flavor into the pizza dough. It produces that highly desirable dark to black blistering on the crust edge that adds to the overall flavor experience of their pies, stromboli, calzones and wings. The kitchen is directed by Executive Chef Samantha Parker, who cut her culinary chops at Campfire and Flying Pig, two very solid places to do so. The pizza and wings are fabulous and I also tried the Baked Ditalini with mozzarella, provolone, pecorino and parmesan served with a Bolognese sauce and was thinking I should have saved some of that as it would have been really nice the next morning. The Bread Pudding for dessert was sliced into cubes and it was delicious. I want to segue into the wine program here as Susan provided some really nice pairings and I thought it would be fun for her to list some popular menu items and what she would pair with them. Let’s start with a Giesen, 2017 Sauvignon Blanc from New Zealand with Spicy Cauliflower. Then a Kuentz-Bas, Pinot Blanc, 2016 from Alsace, France, with Mahi-Mahi Taquitos. For their Fish Tacos she pairs the Vidigal 2017 White Blend from Portugal and the Meatball Pie gets a Tilaria 2013 Villa Pinciana from Tuscany, Italy. So yes, Susan knows her wine and then some. She came on board as the wine buyer and became wine and beverage director in April of 2016. Her background is in wholesale agriculture but she had a lifelong passion for wine and built the program at Privateer Wine Bar and retail shop from the ground up. She is now a sommelier and continues in wine education and is always looking to add to the ever-changing wine lists in both the restaurant and the wine bar. The Privateer wine list has 18 to 20 selections by the glass including a private label made for them by Fallbrook winery. In addition, the head bartender, Eric Klier, works with Susan on an eclectic craft beer lineup. The Marketplace hosts bi-monthly wine tastings and food and wine events and in 2019 they will begin hosting craft beer and food pairing dinners. Upcoming events are a Nov. 8 food and wine pairing with Justin Mund, winemaker at Orfila in Escondido and on Nov 15 they have their inaugural “Beaujolais, Beaujolais! The Beaujolais Nouveau is here!” event. Beaujolais Nouveau is a young, fruity wine that’s released every year on the third Thursday in November and it’s always a fun party. Dec. 6 will be wines from L.A. Cetto in the Guadalupe Valley. Their monthly food and wine pairings are under the “Oceanside Wine Society” banner. The group evolved into the Oceanside Wine Society when the wine bar opened. Currently members enjoy discounts on wine purchases to go and early opportunities to sign up for food and wine events. And what would a place called the Privateer be without a comedy night? Seriously, they host comedians on Tuesdays and they routinely fill the joint. It’s a two drink or food minimum purchase and starts at 7:30 p.m. but it often full by 6:30 with people grabbing food ahead of the show. On Wednesdays, live music happens along with half-price selected wines by the bottle. I’m a big fan of this place so if you have not already had the Privateer experience, it’s one to have for sure. Find them at 1706 S. Coast Highway, Oceanside. Call (760) 453-2500 or www.theprivateercoalfiredpizza.com. I enjoyed reading the article and stumbled just slightly on the typo (“…great food since 2102”)……..reading through the wine pairing list, I was ready to go to their website and check out their other offerings……alas no such website….at least not as spelled in your article. Please proof-read your articles. I’m sure they paid a pretty penny for the profile. One of my favorite places in Oceanside! Not only is the food amazing, but Susan has brought up their game with the phenomenal wines!